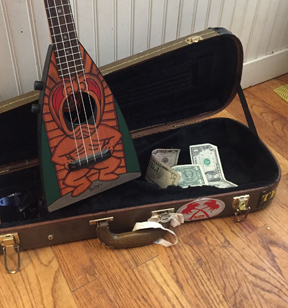 The Dias Uke is considered to be one of the rarest of all Ukuleles. Augusto Dias was a Portuguese immigrant who arrived in Hawaii on the Ravenscrag. Manuel Nunes was the first person to open his own shop in the "Independent Manufacture and sale of Ukuleles" in 1880, and according to a great grandson of Manuel's, Dias was one of his employees. In 1884 Dias split from Nunes and made his own instrument making and repair shop on King Street in Honolulu. Dias Ukes were often made with very intricate inlay and bindings and unusual shaped headstocks. Dias was also a good musician and developed a friendship with King David Kalakaua. It was Kalakaua who became the 'patron' of the ukulele and helped it become Hawaii's musical instrument. Augusto Dias died February 15th, 1915 at the age of 73, five days before the opening of the Pan Pacific International Exhibition which would catapult the Ukulele into the mainstream of US Consciousness. Back to the Database! Back to the Tiki King Homepage!